David Eisenstadt is an expert in antitrust economics and damage analysis, with special expertise in the competitive analysis of health care issues. He has consulted on or testified in numerous merger and monopolization matters involving hospitals, physicians, and health insurers, and his testimonial experience includes U.S. v. Carilion Health System, Howerton v. Grace Hospital, and Holmes Regional Medical Center v. Agency for Health Care Administration and Wuesthoff Memorial Hospital. He has also provided statistical and economic analysis and expert testimony regarding issues such as market definition, alleged anticompetitive effects, merger-related efficiencies, and economic damages. Dr. Eisenstadt has also consulted on numerous antitrust matters in other industries, including data processing, food processing, soft drink bottling, and banking. 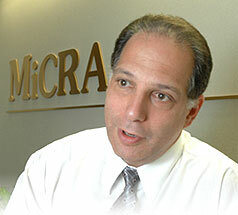 Before co-founding MiCRA, Dr. Eisenstadt was a Senior Vice President at ICF Consulting Associates. Earlier, he served at the Antitrust Division of the U.S. Department of Justice and taught economics at the University of Missouri. As an economist at the Antitrust Division, Dr. Eisenstadt co-authored a major study on the economic and antitrust issues relevant to a variety of vertical restraints. He has also published on the economics of health care and on the economics of nonprofit firms.